Hubby maternal side of the family are pretty close-knitted and they make it a tradition to hold a 'Family Day' anually. It's a day where everyone will gather, eat and simply have fun like the ones held at J's Wok & Grill, previously. 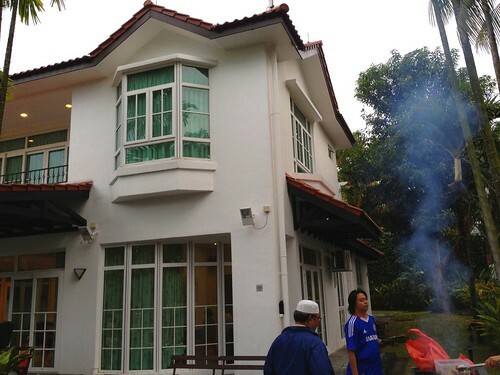 This time, my bro-in-law managed to rent his company's holiday bungalow at 118 Pasir Ris Road (yes, close to home!). And they really mean 'bungalow'. Pretty impressive, I say. It seems like PSA does make an effort to provide good facilities for their staff. 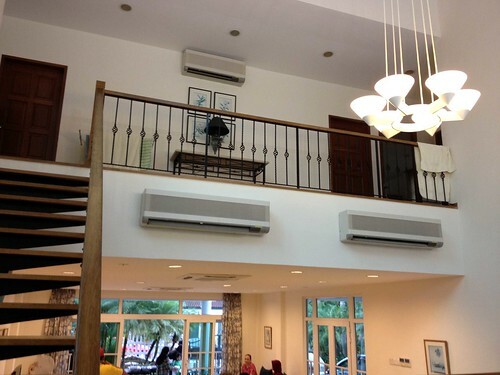 Even their holiday bungalow at Bintan Lagoon Resort was the biggest one, The Angsoka. On the left is the verandah, where we arrange all the food spread. Here's a link that shows the front facade of the bungalow. The bungalow fronted the small road, with the bus stop nearby and then it's already Pasir Ris Beach Park, with the large children playground. The bicycle rental kiosk is also nearby. The compound on the side, which includes the outdoor BBQ pit (follow the smoke). Large living area. On the left are doors that lead directly in from the car porch. The dining area is on the elevated level, further up. On the right is the open staircase (such a nightmare when we have toddlers around!) leading to the 4 bedrooms upstairs and on the left is the door into the kitchen (you can see the kitchen windows in the distance, on the far left). The TV & stereo system. 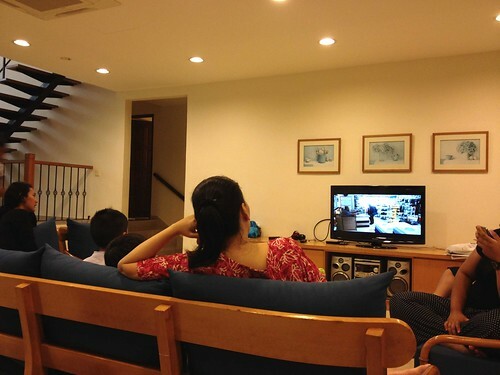 Behind the TV is the recreation room which also hold the karaoke system. Beyond the doorway on the left, the steps lead up to the ground-floor bathroom and a 'Mahjong' (Chinese version of free Solitaire) room on the left. Located on an elevated level (probably due to the uneven ground), with a massive double-volume space. The min. 10-seating round dining table comes complete with a 'lazy Susan'. The doorway on the right leads into the kitchen. Upon entering the kitchen. 3-hob cooking stove and a 2-basin sink. Kitchen utensils, crockery, cook wares are all provided. 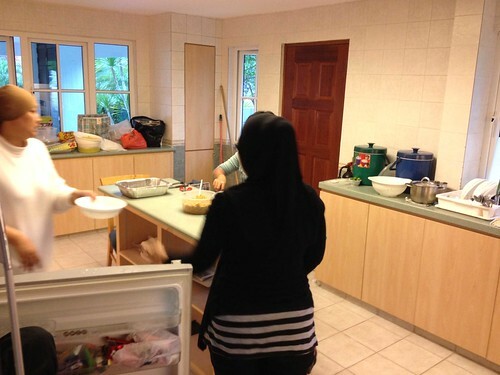 However, for Muslims, I'd advise you bring your own pots & pans or some 'Sabun Sertu' to cleanse them prior to cooking. There's also a large fridge and an island counter. The door on the right leads out to the outdoor wash area (for cleaning of large pots) and for ease of disposing rubbish without have to pass through the house interiors. The windows on the left looks out into the car porch. I love this kitchen. Big & airy! Looking up at the upper level corridor from the dining area. There are 4 massive bedrooms up there (no, I didn't take any pics of the rooms). And a bathroom on each side of the corridor. They also provide large sofa beds alongside the regular beds. Enough rooms for big-time sleepovers! A hit with the kids. Especially when my BiL installed the Nintendo Wii. 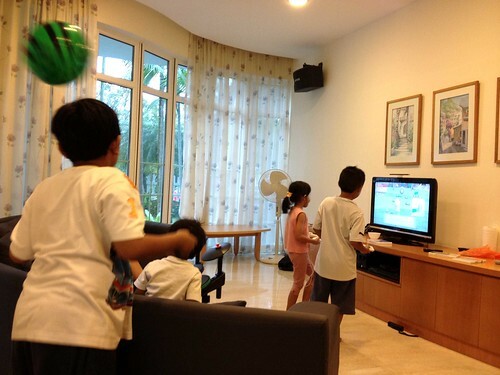 At night, the adults utilised the karaoke machine. No worries, the room seemed to be sound-proof! Good way to watch over the kids when the adults are busy manning the BBQ outside. 2 large charcoal pits. This comes with a built-in sink, even! 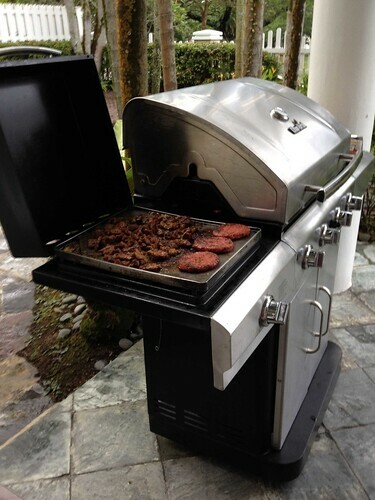 On top of the outdoor grill, they also provide a gas griller that comes with a hotplate. 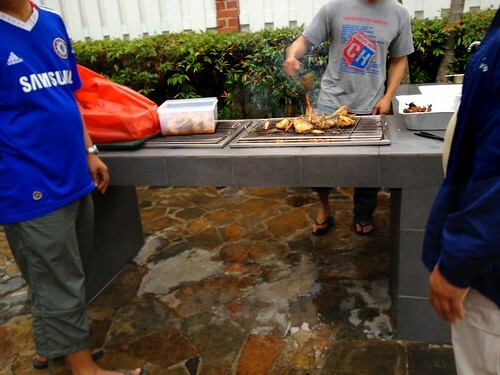 I guess it works as a back-up plan for barbecuing during rainy weather. This reminds me a lot of the famed show by Robert Rainford- License to Grill. He usually had a couple of these gas grillers at his home, by the pool. Wow, that's quite a handful of pics that I've uploaded just showing the bungalow alone. Guess the food pics gonna come in another post. Till then! Apparently this bungalow is meant for the use of PSA's staff. Unless you know someone in PSA who can help you rent it, I'm not sure if the public can. My bro-in-law mentioned that he paid less than $300 for it, though. But then again, it's the staff price. "Those who work under PSA can book through PSA intranet. Junior officer have PSA bungalow pasir ris/Bintan banyu biru( if I'm not wrong)and chalet at changi . For senior hv 3 option in bintan, the other 2 the same pasir ris and changi…"
Hi there, how long does the booking of the chalet take? I asked one of my friends to get it for me, but he's unsure how long it will take to confirm. My BiL usually book in advance. For shorter notice, the dates chosen are usually the 'unpopular ones' like wrekdays instead of weekends. Then again it all comes back to availability. Hi bro and sis.. I'm psa staff..! I'm interested about this bungalow, may I know if è price u stated is per night or thoughout your stay...? Not too sure but I remember that it was a pretty good rate. Maybe it's for the 3D2N stay. It's for Staff after all. Maybe you enquire at your company's Intranet? It was my bro-in-law who booked. He did it thru the Intranet. It's first come first serve. Usually he end up renting over midweek just because it's available! hi. i really interested in the psa bungalow. can you recommend me anyone who is working at psa ? My BIL is the one but I think slots are pretty much full for now. He hadn't booked the place for sometime already. Askum! Hi there! I came across your post! Was wondering if u are able to get your BIL to help me book the bungalow chalet for an event in august? Weekend. I am more than willing to pay a fee. Hehe. Please let me know! Thank you so much! I'm afraid it's not possible for my bil just booked the bungalow last month. And 2-3 months is prettty short notice. They usually start booking from 6-months up. 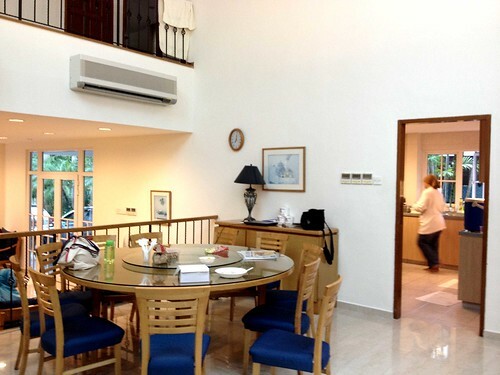 Maybe you can try the PA bungalow next door or Pasir Villa located a few blocks down at 116 Pasir Ris Rd. 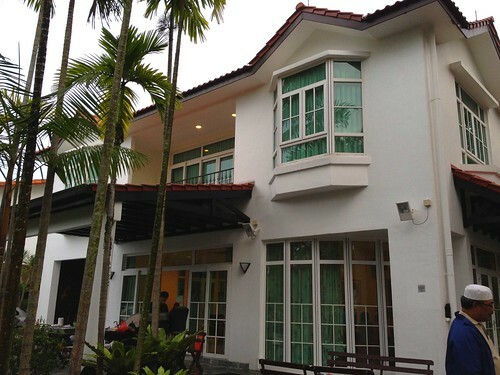 (https://www.facebook.com/pages/116-Pasir-Ris-Villa/211653472185227). Salam....hi...is there any swimming pool?? How do I book thus bungalow? This bungalow only available for Senior PSA Officers only. It's their company holiday bungalow.